All her young life has been lived in the shadow of her father’s disgrace after he was caught cheating at cards at his Club in London and Alita Lang lives a dismal life under sufferance with her begrudging aunt and uncle, the Duke and Duchess of Langstone. In fact the only love in Alita’s lonely life is her passion for her uncle’s thoroughbred horses, especially her beloved stallion, Flamingo, who she has taught many tricks to. 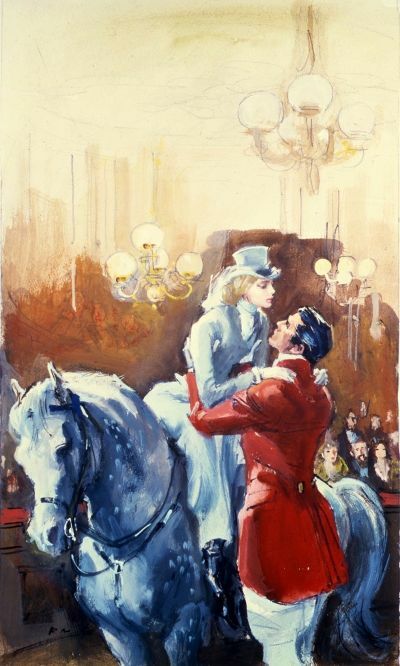 She spends most of her time in the Duke’s stables and can train the most unruly horse And now the Duke, desperate to raise money, is determined to sell them all to the brash American multi-millionaire who has just bought the neighbouring estate and its magnificent Marshfield House. Introduced to the handsome, blue-eyed and tanned Clint Wilbur as Alita Blair, an employee of the estate, she soon finds herself working for him on improvements to his stables and soon, through his consistent kindness and gentle thoughtfulness, she discovers an alluring new side to her new employer and ally. Suddenly Alita’s heart is racing as she realises that she is in love. But surely the race for love is already lost because the Duke is already scheming for his daughter, Hermione, to marry the eligible millionaire and join their two estates together.